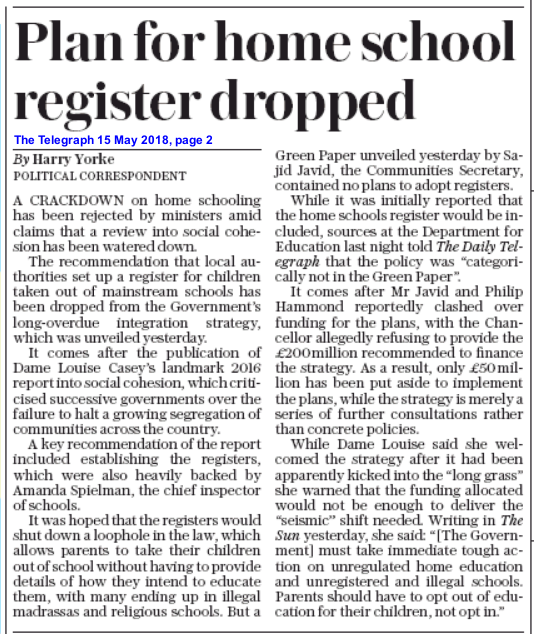 The Integrated Communities Strategy, published 15 March 2018 (see our comment) made clear that those demanding compulsory registration for home educators were to be disappointed. Greg Hurst’s confident pronouncements about registration in The Times several hours before the Green Paper was published turned out to be fake news, false hope or maybe just bad briefing. The Department for Education, quoted by Harry Yorke in The Telegraph (print edition), says that the policy is “categorically not in the Green Paper”. At first glance, this may appear to be just a case of poor journalism on the part of the Times, which has spearheaded a vicious campaign against home education with a series of articles in recent weeks. But actually, the Green Paper is a case of one battle won, while the war rages on. Undaunted by her apparent defeat, Louise Casey continued to rail against the decision throughout the day, following her article in the Sun (13 March 2018) in which she declaimed that the government “must take immediate tough action on unregulated home education and unregistered and illegal schools. Parents should have to opt out of education for their children, not opt in”, followed by the ominous phrase, “We need to know where kids are and what is happening to them”. Why must the state know where children are? That is a parental responsibility, not a state one and, as yet another Serious Case Review into child sexual abuse is published, the state needs to be held accountable for the way it has failed to safeguard thousands of girls around the country who have been (and continue to be) victims of gang grooming while the authorities look the other way. Although Lord Agnew is on record as refuting the option of registration, it seems from his contribution to the Lords’ debate on Children Missing Education (15 March 2018) that he is shifting his position considerably. He acknowledges that concerns have been motivated by the Soley Bill and he says that he will watch the progress of the Bill through Committee ‘with interest’. He outlines the nuances of the argument – parents who refuse to register, parents who would rather go to jail – but ends by saying that he is now open-minded about the issue of registration and is unable to give a ‘unilateral decision’. So the door remains open for the Soley Bill to progress. According to the Telegraph, the failure to include a registration policy in the Green Paper was due to funding, as the Chancellor refused to come up with the £200 million needed to implement it. Funding has saved the freedom of home education from regulation at this point, but its advocates will continue to demand it with unabated zeal. While we can hope that the Soley Bill is sabotaged at Committee stage by a sea of amendments, it will only be seen as an interlude in the war. The fact that Lord Agnew mentioned the Hardy case in a Lord’s debate is evidence that politicians are becoming aware of the views of the EHE community. They must also be aware of the intense fight they will face through the courts on the grounds of human rights. Continue to raise the profile of EHE and your rights, enshrined in law, to make that choice.